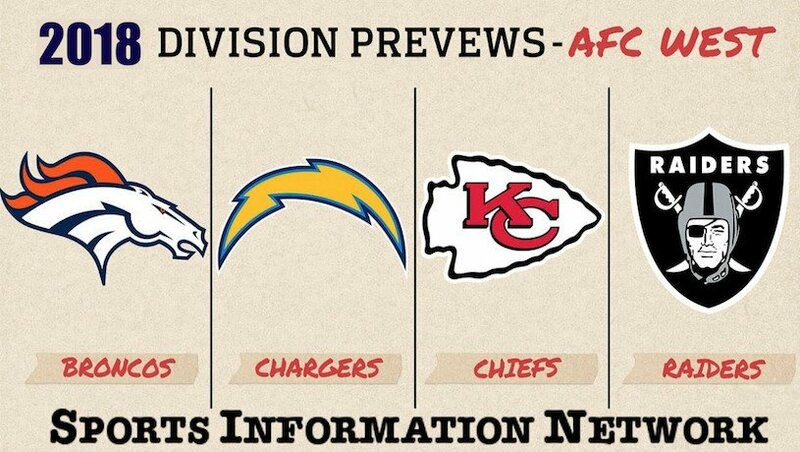 In the AFC West this year we have a three-horse race to the finish line. The Broncos will be the odd team out and the Raiders may quickly fall behind as well if Gruden doesn’t get his coaching decisions into the 21st century. The Chargers are my pick to win the division this year (+125 favorite at time of writing). I think Rivers and Gordon can take this team deep into the playoffs and while the Chiefs will be tough competition, the Chargers just edge them out for the division title. Under 7 +120 – I think the Broncos will struggle in the run game which will put extra stress on Keenum and the passing game. Sanders is coming off an ankle injury that had him hampered for the latter part of the 2017 season. I do think he and DT are solid, but I just don’t see much beyond them to be excited about on the offense. The defense should be strong, I will be looking to bet their games under the total this year. Over 8.5 -110 – Taking the over here mostly because if Andy Reid (big if) allows it, this should be one of the most fun offenses to watch this year. Every skill position is loaded with talent and upside. Their defense has several new players at starting positions so unsure how that will play out but I don’t think they have any problems putting points on the board. I think they can win 10 this year.